If you can imagine what kind of dedication it takes for a 12-year-old to develop the musical talent required to perform Rachmaninoff’s Piano Concerto No. 2 with the Havana Symphony Orchestra, you can only guess what sort of skill that kid possesses several decades later after devoting every day in the meantime to his keyboard. Nachito Herrera’s resume reads like a list of headlines. He’s won a Grammy, an American Heritage Award, an Immigrants of Distinction Award and has even been nominated for an Emmy. He’s directed, conducted and performed in numerous high-caliber symphonies and orchestras all over the globe, composed scores and tunes for Hollywood films and led a variety of his own bands, composing and performing everything from classical to Afro-Cuban jazz. His first memory of the piano was his father – also a professional pianist – practicing with his big band in the family’s garage in Cuba. He began playing at the age of 4. By age 7, his classical piano career was already in motion. “I remember when I started playing simple notes. My dad was teaching me. Then I went to the classical musical school in Cuba. It takes about 16 years to get your PHD and I did it all the way through. Then I took an extra five years to get my PHD as an orchestra conductor. Right when I was a teenager I started to also be interested in other styles like jazz and Cuban music,” Herrera says. It’s his passion for these three types of music – Cuban, classical and jazz, arguably the most difficult genres to master – that motivates the musician to spend the majority of his time on the piano. Even if he’s not performing or rehearsing, he practices eight to nine hours a day. “Respecting each audience is the most important thing for me. I practice every day as [if it’s] my first time practicing as a student,” he says. 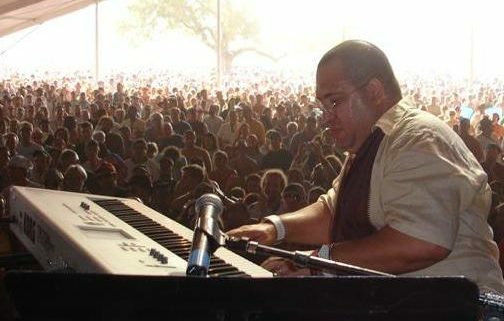 Herrera’s all-day practice sessions involve at least a couple of hours of finger-strengthening exercises as well as trying out improvisation scenarios with a variety of musicians. A large block of time is dedicated, of course, to technique training. Essentially, the Cuban’s aim, regardless of performing on a huge stage with 30 musicians or in an intimate club with his trio, is to enrapture. Nachito Herrera and his trio make their Vail debut with a pair of intimate performances at The Sonnenalp’s Ludwig’s Terrace on Wednesday, July 11. Doors for the first seating open at 5 p.m. with performance beginning at 5:30. Doors for the second seating are at 7:30 p.m. with music starting at 8 p.m. Tickets at $40 or $136 for a subscription to four of the five Club Series performances through Aug. 8. Full dinner service is available, not included in ticket cost and a $30 per person food or beverage minimum applies. Nachito Herrera ramps up to a septet for the big stage at the Jazz Tent at Vail Square in Lionshead at 6 p.m. on Thursday, July 12. Herrera says his intention in designing the Night in Havana performance was “to show to the audience the versatility of the music we have in our country. It’s making a musical tour around all different styles, Latin jazz, cha, cha cha and classical. From east to west, when you visit my country, it’s unbelievable how you can absorb the different styles of everything from food to music. They’re all about celebrating that we’re alive and we’re together.” Tickets are $25 for general admission, $40 for preferred seat and $50 for premium seat. Subscriptions are also available for multiple performances. Beer, wine and cocktails are available for purchase.